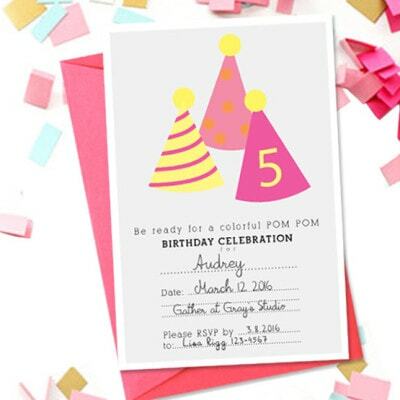 Colorful Pom Pom Birthday Party! Party time! 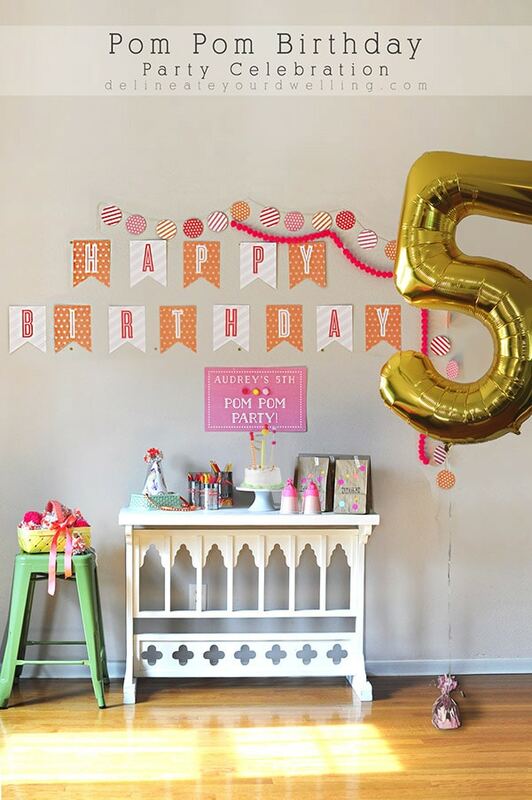 My little girl just turned FIVE and if you’ve been following along, then you know that our family rule is parties with friends are allowed at 5, 10 and 15 years old. 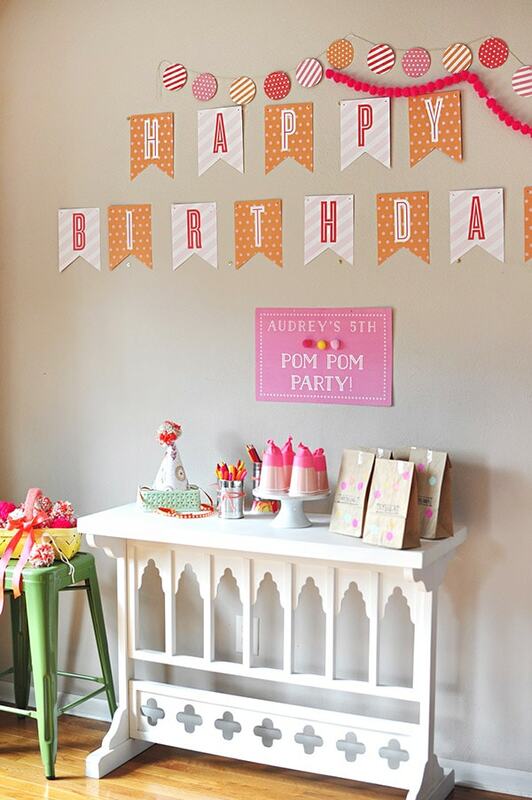 So… this was our first ever friend party and we agreed upon a Colorful Pom Pom Birthday Party and we had such fun! This party of five little girls (and my son) was such a blast. I loved planning for it, crafting for it and then finally hosting it. 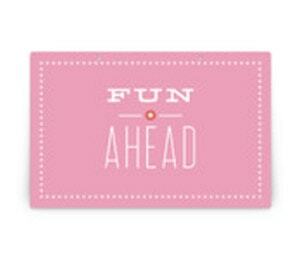 Many of the gorgeous paper items were from Minted, a company that makes the most lovely products. I’ve been so impressed with the notebooks I’ve bought from them in the past and this was my first time using their party products! We started the party with Coloring Party Hats. The girls absolutely loved this and it was a great way to welcome them into our home and have them start the party off with a calm ice breaker type activity. 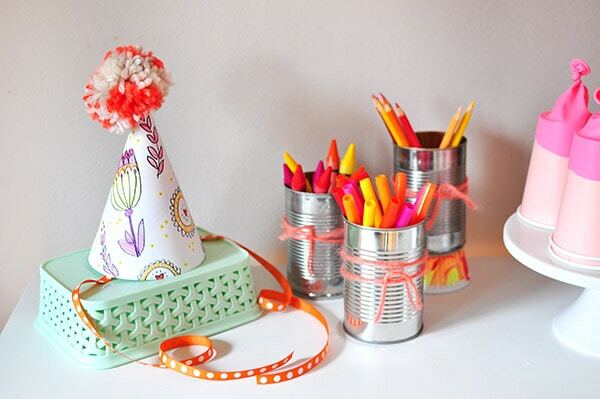 I saved a few old soup cans and tied them with yarn to hold all our coloring supplies. Everyone was so engrossed with coloring that we all worked up an appetite, so next we moved to CAKE TIME! 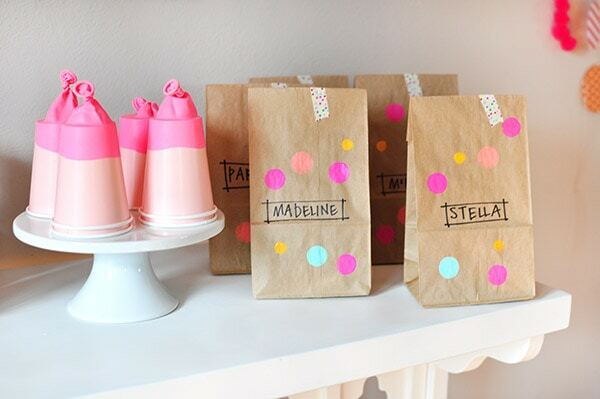 Notice the adorable polka dot napkins? 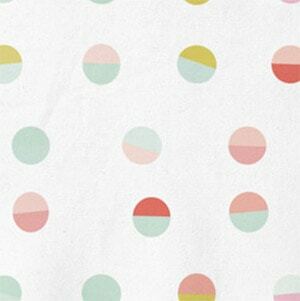 You guessed it, Minted fabric (this fabric is such high quality)! 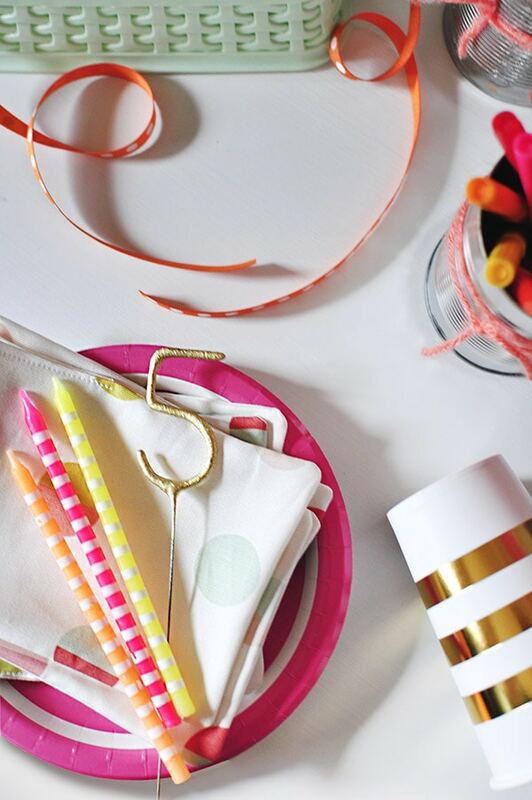 I love fabric napkins and we use them all the time so I knew we’d get more use out of them. Plus, even I can sew simple napkins. 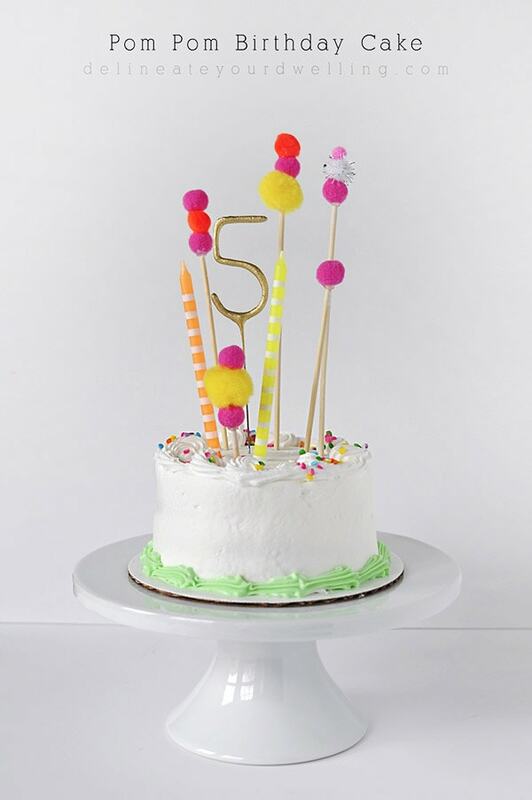 I bought two mini cakes from the grocery (which ended up being the perfect amount of cake for us all) and added my own DIY Pom Pom cake topper. 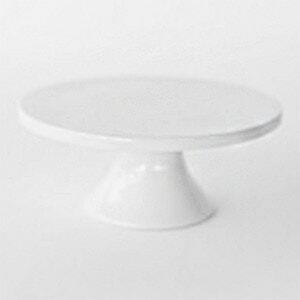 That paired along with this gorgeously modern Minted cake stand made for quite the party statement! After we finished cake, we moved on to a more active game… and it wasn’t really even a game but the girls had so much fun, we ended up spending some time on it. 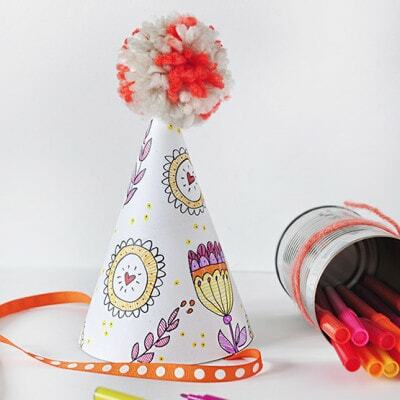 I had made simple pom pom poppers. I got the idea from my friend, Alexis, at Persia Lou. They are so simple and we just popped pom poms for a good while, laughing and laughing. 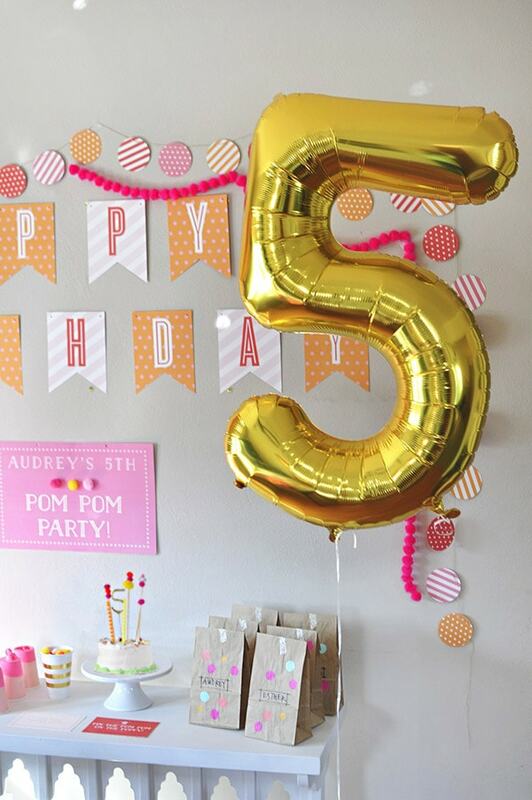 I found this gold “5” mylar balloon and at such a reasonable price, I couldn’t pass it up. It was 34″ tall… and such a fun addition to the party. I got this inexpensive helium kit and we added tons of balloons to the room (they have them at Target, too)! Then we moved onto Pin the Pom Pom on the Poppy pom pom game! Big hit, big hit. And you better believe my daughter spent most of the game twirling around in her Pom Pom party skirt. I sent everyone home with a small goodie bag. 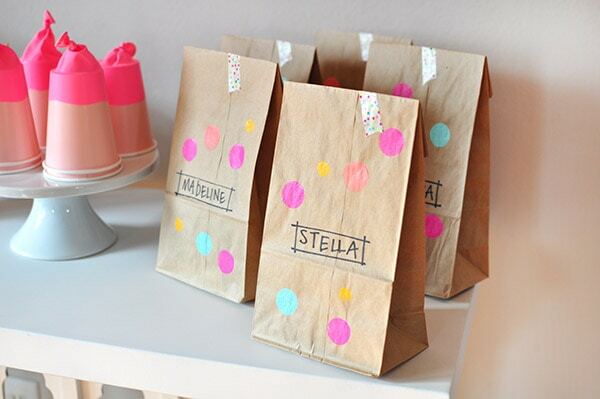 I simply stamped brown paper bags with bright bold paint and added their name and washi tape! I can not over look the gorgeous paper decor on the walls! Minted’s products really set the tone for the entire party. 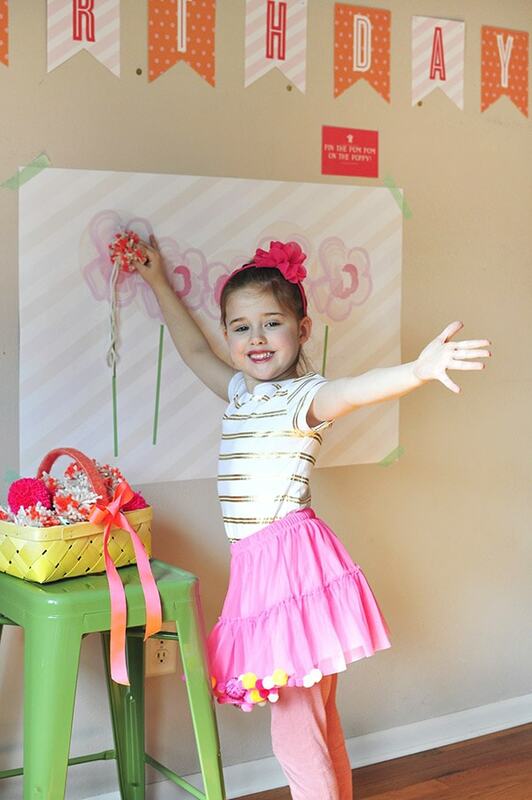 I used numerous items from their Pink Big Top Circus party supplies. 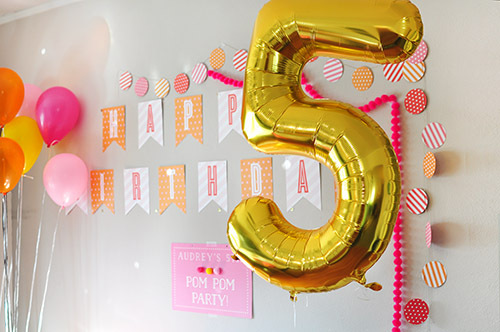 The part I loved the very most about Minted was that every single thing was customizable, from the party banner wording to the actual patterns used on the background! 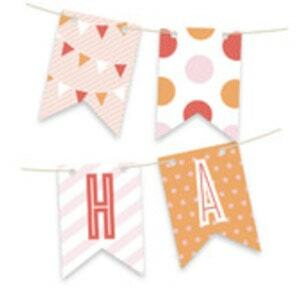 I ended up using the Bunting Banner, Circle Garlands, Table + Party Signs and Table Confetti. 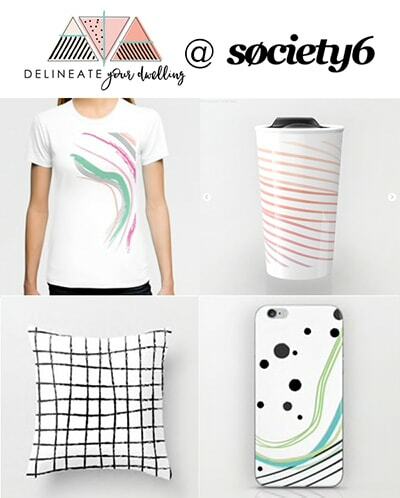 I could get lost on their site, there are many wonderful items there. 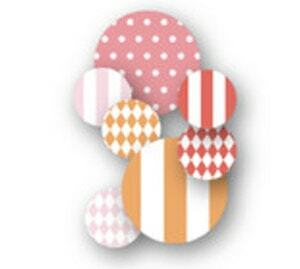 Thank you to Minted for suppling so many of the gorgeous party supplies! You can see the full list below. 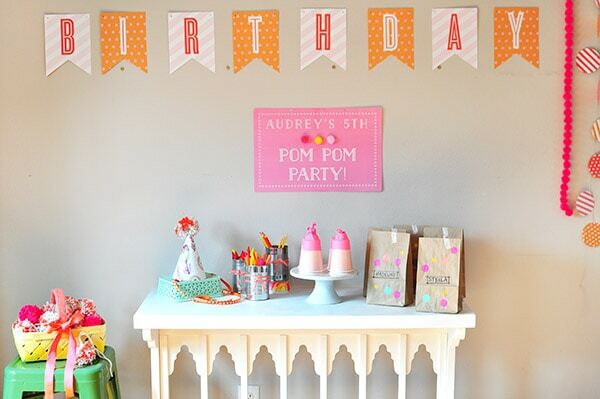 And for more detail on the DIYS that went into the party, you can see those posts here! Oh I love this party!! So fun, and I love that you made the poppers! Thanks for the shout out. 🙂 That cake is still my favorite thing ever. 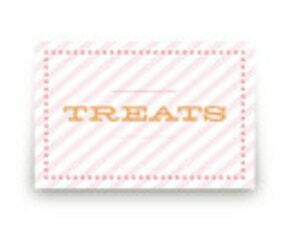 And who knew that Minted had cake stands too? Awesome! I kind of want to keep reliving that party because it was such fun, ha. And I was happy to give a shout out your way, I’ve had your poppers pinned for ever and was glad to give it a try. 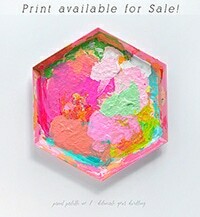 Minted is really coming out with some great products! I had wanted to add pom poms to the balloon strings but ran out of time! But you are right, your little pom pom balloons would have been the PERFECT touch! What a sweet party! 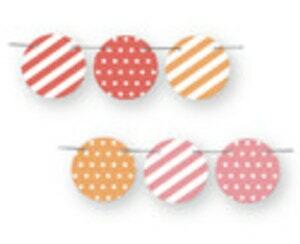 I have to do the pom pom poppers, my husband’s young cousins would love those! Your kids are lucky indeed! I have to admit… they are so fun for adults, too! ha. So cute! I love the stand you used as display, where did you get that? Love all the pom poms!! Thanks, Laurel! The white table, used to be sage green and I got it from Cost Plus World Market! Okay, as a 32 year old woman, I want that party. So cute! 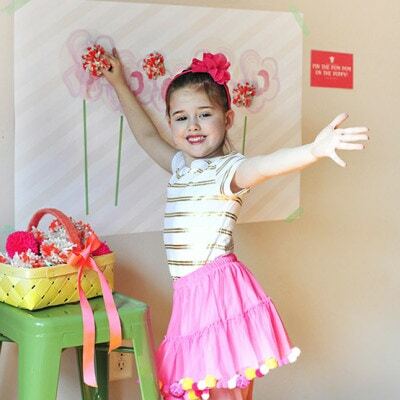 What a lucky little girl your daughter is to have such a fabulous mom to throw her such a fabulous party! 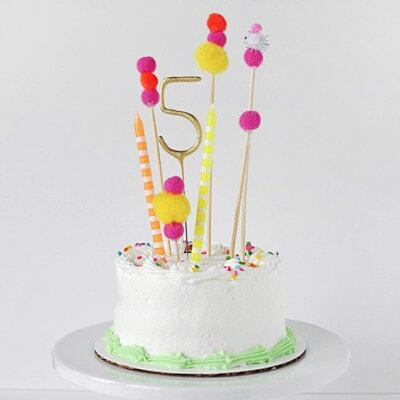 I think my favorite thing is the pom pom cake topper!